Today students learned that Transportation Engineers are hired by towns to help them make their intersections both safe (no one gets hurt) and efficient (no one has to wait a very long time to get through an intersection). Part of the job includes using the EDP to help make observations, ask questions, brainstorm possible solutions and then choosing the best idea to try out. Today we focused on the ASK and IMAGINE steps of the EDP. We observed a few different types of intersections to begin learning how they work. Students used the Engineering Design Process to solve a problem. After watching the videos below, we discussed the idea of a system (different parts working together) and the job of Transportation Engineers. One aspect of their job might be to study the SAFETY and EFFICIENCY of an intersection. We will have a discussion about this text when I return. Welcome Mrs. Stile and Mrs. De la garza! We are excited for you to listen and learn about our persuasive speeches. If you look to the right margin, you will see all student blog links. Click on any name and enjoy! During our science unit on Ecosystems, we have been studying: How do organisms interact with each other and their environment to survive? 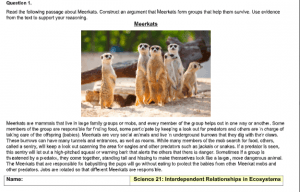 In today’s lesson we constructed an argument to explain how being a part of a group helps Meerkats to survive. Students provided a claim, evidence and a reasoning format. 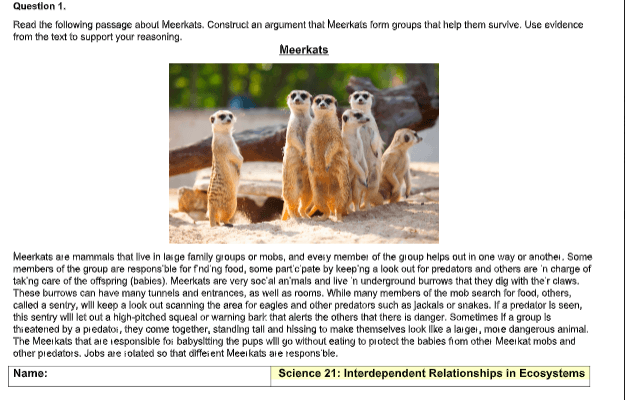 We read the informational text below on Meerkats and watched the youtube video from National Geographic to learn more about this species. As we gather and discuss information about animal behaviors and the effects of survival for each group, we realize some species can adapt, survive, or become extinct based on many factors. From previous lessons, we learned about natural habitats and whether or not animals can survive in another habitat. The additional videos below have helped us bridge these concepts and understand how organisms can survive or possibly not survive, if the environment changes enough where organisms cannot adapt.